The part above the ground of perennial herbaceous plant Cirsium setosum (wild.) MB. of family Compositae. In summer or autumn when blossom. Light smell and slightly bitter. Yellowish green stem with purplish and brown color and no impurities. Cleaned and dried in the sun; unprocessed or stir-baked into charcoal. Sweet, bitter, cool; heart and liver meridians entered. This herb is cool and cold in nature, and good at clearing heat in blood system to stop bleeding. Thus it is indicated for bleeding due to recklessly blood flow resulted from blood heat such as hemoptysis, hematemesis, epistaxis, hematochezia, and metrorrhagia and metrostaxis. When singly applied, take its extracted juice or pound it into paste for external application. It is always reinforcing by combination with other hemostatics. For instance it is combined with Da Ji, Ce Bai Ye, Bai Mao Gen and Qian Cao in Shi Hui San from Shi Yao Shen Shu (Miraculous book of Ten Recipes). It also can relieve stranguria and promote diuresis. It is good at treating hematuria and blood stranguria and can be used alone. For instance it is combined with opening and dredging herbs for smoothing such as Hua Shi, Zhi Zi and Dan Zhu Ye in Xiao Ji Yin Zi from Ji Sheng Fang. It can clear heat and relieve toxicity, and in some degrees eliminate blood stasis and swelling, so it is indicated for the beginning of swelling and pain of heat-toxin sores and ulcers. When using it singly, pound the fresh into paste for external application. 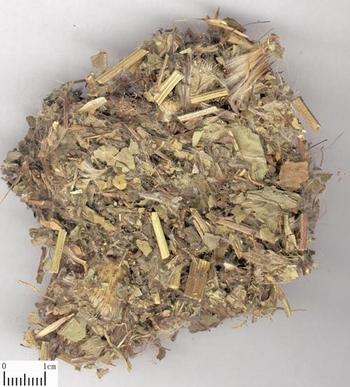 It is combined with blood-moving, swelling-eliminating and pain-relieving herbs such as Ru Xiang and Mo Yao. Decoct 10~15g, 30~60 g of the fresh. Proper dose for external application and smashed.